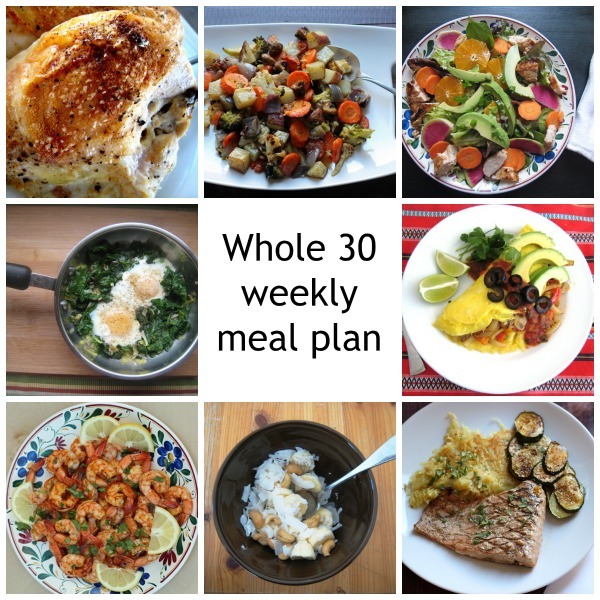 Here’s my meal plan for the week, Whole 30 compatible, and pretty darn delicious! As you know, we are into our Whole 30 here. I say we because my husband and eldest son are joining me. I’m afraid it may be difficult for my husband being at work for two meals of the day, but we’ll see how our meal planning goes. Speaking of meal planning, if you’d like some extra help in that department, today I’m sharing my week’s meal plan. Since the Whole 30 focuses on three square meals a day, this plan includes 21 meals, a little bit bigger than the meal plans I normally post. Feel free to mix and match as you please. I sent a copy to my mom last week, and I think they’re going to start the plan soon as well. I’m out of town for all of Monday — should be interesting eating on the road — so I’ll be doing my big meal prepping (chopping, slicing, dicing) later this week. I have the meal plan and grocery list available in a free download for you, my friends. Please be sure to read all the notes! Drop your email in the box below and I’ll send the meal plan your way pronto. My kids who don’t want what I’m making will have cereal, granola, or oatmeal with fruit. Denver Scramble – Make sure to use Whole 30 compliant ham or substitute compliant chopped sausage or prosciutto for the ham. 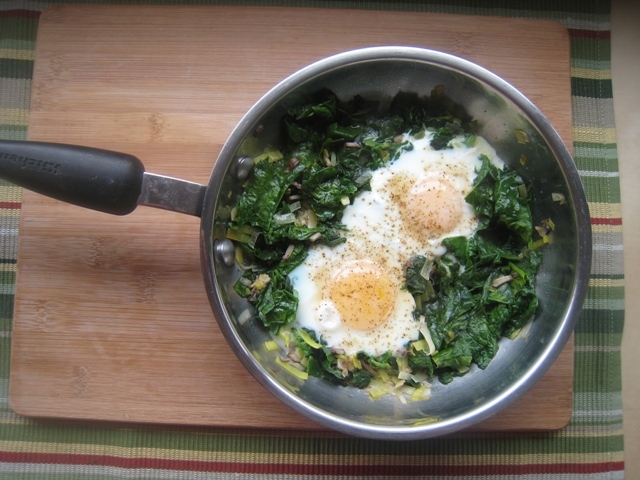 Skillet Eggs – Don’t worry about which type of greens. Just use what you have. Stuffed Breakfast Potato – Don’t use the cheese or sour cream. Use a sweet potato if you struggle with limiting your white potato intake. Fajita Omelet – Don’t use the cheese or sour cream. If my kiddos aren’t into what I’m having, they can have sandwiches or quesadillas. These are all very packable lunches so I should be able to provide lunch for my husband. Chef’s Salad with Garlicky Anchovy Vinaigrette – Omit cheese. 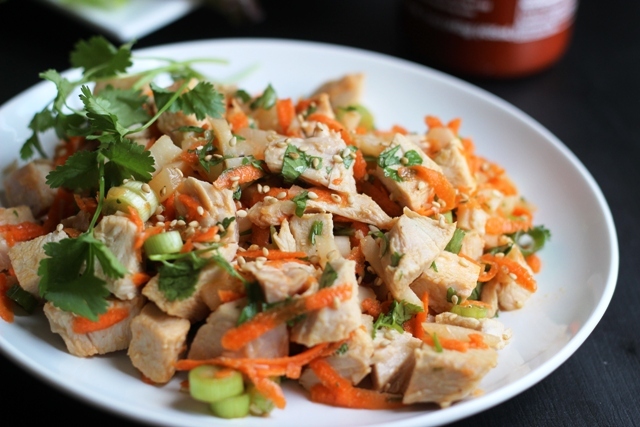 Ginger-Sesame Turkey Salad on a bed of greens or in lettuce wraps – Substitute coconut aminos for the soy sauce. Substitute chicken for turkey. Green Salad with Sun-dried Tomatoes and Almonds – Omit cheese and add chopped steak, roast beef or chicken. Poorman’s Chicken Caesar Salad – Omit the Romano cheese and croutons. My kids will all have the same as us Whole 30 people, but I’ll add pasta or rice if they need it. They probably won’t. Shrimp on the Barbie and Mixed Grilled Vegetables – Add a baked sweet potato if you think you’ll be extra hungry. 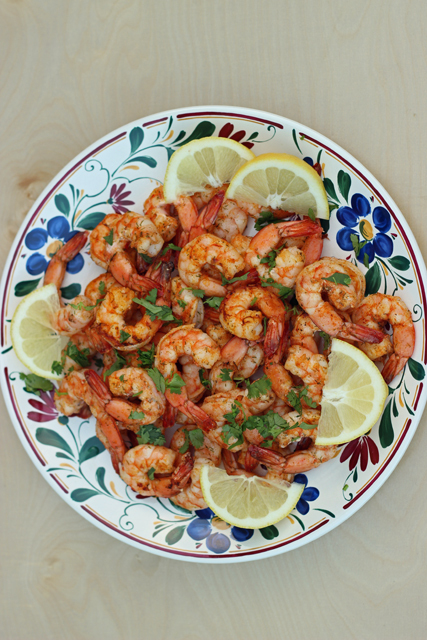 If the weather isn’t grill-friendly, sauté the shrimp in a hot skillet. Spicy Southwest Grilled Chicken and Jessika’s Roasted Vegetables – Omit the soy sauce from the chicken marinade or use coconut aminos instead. If the weather isn’t grill-friendly, sauté the chicken in a hot skillet. The Whole 30 “rules” are designed to help you beat your cravings and reset your body to enjoy nutrient-rich foods. Having done this once before, I know that it was nice to have a good hot drink each morning and to have the occasional “sweet” to enjoy with my meal. Homemade Salsa – You can use this as a topping for some breakfast recipes. Coconut Latte – hot coffee or espresso with light, canned coconut milk (foamed if you have the means) and a sprinkle of cinnamon and cocoa powder. This is also tasty served over ice. 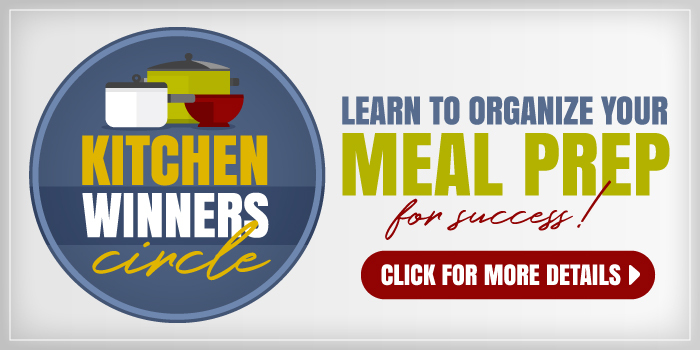 Get a month’s worth of Whole 30 recipes, grocery lists and prep tips in one of my featured protein-focused meal plans. This meal plan provides you with all the tools you need to enjoy 30 dinners of naturally gluten- and dairy-free deliciousness. No weird ingredients or soaking required. It will make your life so much easier! I’m on day 29 of my whole 30. Woo hoo! Just wanted to share three great recipes. I know your the recipe master but I have really enjoyed these so want to share. And finally a tip on whole30 coffee. I hated the greasy taste of coconut milk in coffee. I tried black but nah, so what I do is brew my cup of jo, then stir in my coconut milk, and then give it a spin in the blender. Yea, it sounds like a lot of work, but the coconut milk really blends in the coffee well, and it gets kinda foamy like a latte. It’s much better this way, also try it with ghee, it sounds weird, but it’s yummy. Thanks so much! I’ve been foaming the Trader Joe’s light coconut milk in my espresso maker. Super yummy in coffee. Put the coconut oil and coffee in blender, it makes it creamy with a little froth, so good and not oily at all. My husband and I are largely vegetarian but eat seafood (primarily fish) once or twice a week. Not all of this food would work for us, but I have to say that some of this looks really great–starting with the greens and fried eggs! Thanks for sharing. My husband and I started the Whole 30 this month as well! I didn’t even know you were doing it when we set our start date. 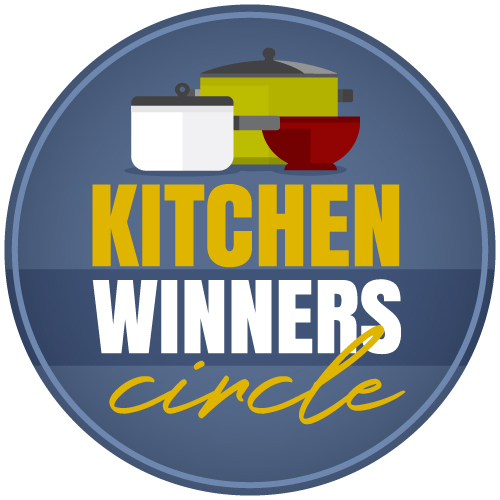 I am super excited to follow along with you this month and glean from your recipes!! Yes. http://whole30.com/2013/06/the-official-can-i-have-guide-to-the-whole30/ I would recommend reading the book first as that lays out the entire plan. Started mine too, Feb.1. Will be following along. I just left a message, but it disappeared??? Was saying that I made the mistake of weighing this morning and don’t think I have lost any weight after 10 days. How is it that eliminating sugar, grains, dairy, wine and the scale doesn’t move. If eating clean and healthy doesn’t do it what will? I see now why they say don’t weigh, I need to lose 50 pounds and was really hoping to see a couple pound loss. I am just impatient and eating more calories I guess. A pep talk would help. Don’t worry yet. But, are you getting past full? That was my problem the first time. I didn’t stop when I was full. Also, it would probably be helpful for you to read their timeline: http://whole30.com/2013/08/revised-timeline/ Days 10 and 11 are supposed to be hard and you’re NOT supposed to weigh yourself. 🙂 Hang in there! I’m with you. Day 12 should be AWESOME! Thanks for this! I have recently decided to stop being a slave to my sugar cravings but was really intimidated to try to create a Whole 30 menu. And I don’t do well without a menu plan for the week. You are a lifesaver!! I find that I end up repeating meals so I haven’t made another meal plan. Does this give you enough variety? Day 18 and no boundless energy, no awesomeness and very gassy. Wonder what is up with that? Have been taking digestive enzymes, can’t say they are helping. And yes, I think I may be eating past full, which is a bad habit. I’m with ya! Day 14 for me and I feel so much worse. 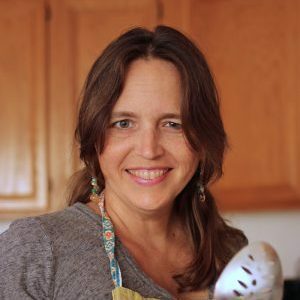 My friend posted this article that the whole 30 program wrote explaining everything but personally… I don’t see the worth if I am feeling so awful every day. It is making me moody, cloudy, irritable, etc. anyway, curious to see if your energy ever caught up? Jamie, be sure that you read their extra recommendations for nursing moms. Having had one child with failure to thrive due to my milk supply, I don’t want that to happen to anyone else. Search the whole30.com site for information on that. I’m not sure if you are done with your Whole30 yet, but I feel your pain! I did a Whole30 while breastfeeding and it was killer! From personal experience, adding in oatmeal to my whole30 diet helped a lot…I know, I know, technically NOT a whole30, but my body needed that extra nutrition to feed my baby’s needs. Hope you found what helps you! I’m late in finding this, but at least I found it! My husband and I are just starting to research the pains of sugar and how it’s related to 1) my stubborn dunlap belly and 2) his stubborn blood-sugar levels that he can’t keep under control. 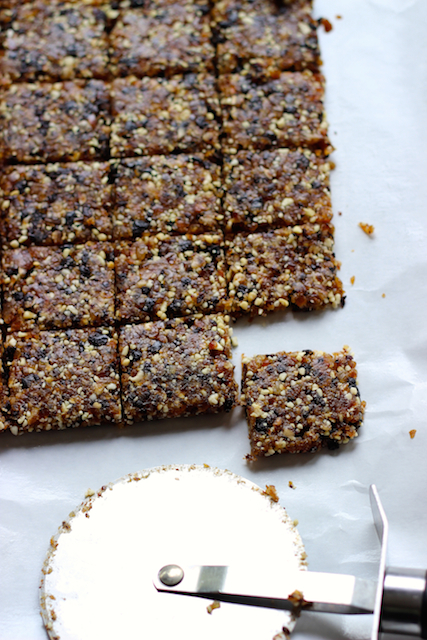 We decided to do a 3 day sugar detox and after that…well, I’m glad I found THIS! So glad you found a solution! Let me know how you like the meal plan! Today is day 1 for me and my husband. As I am looking through all the great meal and recipe ideas, I notice that none of the plates include the avocado, olives, nuts/seeds, coconut and coconut milk that is indicated on the meal template in the book. Am I reading this wrong? I thought you had to include those with every meal. You don’t have to include them in every meal, you can if you need to. That’s how I read the template. I followed the template and ended up eating more than I really needed. I think that’s why I didn’t lose weight. I would consider the template as an allowance, not a requirement. Thank you for this meal plan. I’m useless without a good meal plan and when I decided to take the Whole30 challenge, I didn’t know where to start. I have one question though. The beef and eggplant stew calls for flour but I’m not supposed to have that. What can I use as a substitute? Just leave it out. Somewhere we made a note of that, but obviously, it wasn’t clear. Thanks for pointing that out! Awesome ideas!! I got my Whole 30 book ordered. Going to start soon. Probably here with your plans. Thanks for sharing!! In the photos at the beginning of this article, directly under the title, there is something that looks deeeelicious, but I don’t see the recipe for it anywhere in the article. It looks like bananas, coconut and cashews. Is that all it is? or is there something that “holds it all together”? Typically I would put something like that over yogurt. First I want to say that I LOVE that you said you love Jesus! I am a worship leader at my church and being a Baptist we can certainly put on the spread for food and that spread has made it to my waistline! My wife and I are only 5 days into the whole 30 and I have lost 6 pounds and feel great! We had our first encounter with the restaurant today celebrating my Father in law’s 94th birthday. We asked to have our food specially made (in a nice way) and they were great. We were talking on the way home that we needed a place where we could get meal plans for the week since we both work and need to prepare after church for the rest of the week. That’s how we found you! Thank you so much for the web site and I will support you and you hard work. Hi Mike! Thanks for your encouraging words. I’m so glad that the meal plans will be a help to you. There’s a lot of Whole 30 stuff here and more to come in April. I’m diving in myself — if I keep the courage — and I’ll have a deluxe meal plan available on Thursday. Thanks again. I made most of these dishes the first week of my Whole 30 and I have to say they are delicious! Can you tell me how many servings are in the recipes? They can vary, but in general serve 4. The potato is often a controversial item on the list. Last I checked, it was “allowed” but advised with caution. If that’s a carb that is hard to hold back on, they advise opting out of it.